Individuals who have Medicare Part A and/or Part B may enroll in a Part D plan. Medicare Part D plans are offered by private insurance companies and must be approved by Medicare. Plans vary in premium and coverage (covered drugs, co-payments and deductibles, preferred pharmacies and mail order options). Not enrolling in a Medicare Part D plan, when you are eligible, may result in a late enrollment penalty. You do not need to enroll in a Part D plan if you have “creditable” drug coverage through an employer policy, VA benefits or TriCare for Life. You should evaluate your Medicare Part D plan every year between October 15 and December 7. Most people find they can save money if they switch to a different plans. Your new plan will begin January 1 of the next year. Contact SHIP at 301-255-4250 for help in evaluating your options. Download and complete the 2019 SHIP RX Worksheet and mail it to the SHIP office. We will evaluate your options and send you lowest cost Medicare prescription drug plan options to consider. For a guide to how to enter your drugs and shop for a Medicare Part D Plan, download the Self Help Guide for PDP or go directly to Medicare’s plan finder tool to evaluate the best policy on your own at Medicare.gov/find-a-plan/questions/home.aspx. Currently there are two Programs available to reduce your Part D prescription drug costs. These are the Low Income Subsidy (LIS) and Maryland’s Senior Prescription Drug Assistance Program (SPDAP). Each is detailed below. The Federal Government’s LIS, also called “Extra Help,” is a program administered by Social Security. If you qualify, you get help paying for your Medicare Part D plan’s monthly premium, deductible, and for some of the costs of your prescriptions. You also have the option to change your Rx Part D plan every month. To be eligible for LIS, income should be at or below $18,975 for an individual or $25,605 for a couple. Income can be higher if you are working and a portion of your income is from earned wages. There is also an asset test of $14,390 or less for a single person and $28,720 or less for a couple. Assets include savings, stocks, bonds, IRAs but not your home or car. LIS applications can be completed online at the LIS Application page or are available by mail from the SHIP office at 301-255-4250. You can also apply directly through Social Security Office at 1-800-772-1213. 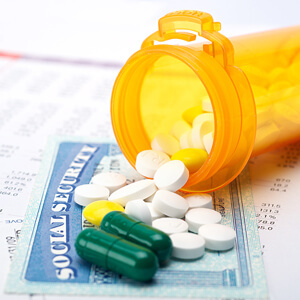 The State of Maryland program that provides eligible Medicare beneficiaries with help paying their premiums and/or cost sharing for Medicare Part D prescription drug Plans. If you are eligible for SPDAP, you may have one more time during the year to change your Medicare Part D Drug Plan. You may be eligible if your income is at or below $37,470 ($3,123 monthly) for a single person or $50,730 ($4,227 monthly) for a couple — with no regard to your assets. SPDAP will pay (up to) $40 each month toward the premium in any Part D Drug Plan or Medicare Advantage Plan in Maryland. SPDAP also may reimburse you for your out-of-pocket costs in the coverage gap, also known as the donut hole. If you submit your out-of-pocket expense claim by 31 May, 2019, based on your prescription drug plan’s 2018 end-of-year summary notice, SPDAP may reimburse you up to $1,700 for donut hole out of pocket expenses. To apply for SPDAP, call SPDAP at 1-800-551-5995 or go to MarylandSPDAP.com. Applications are available from SHIP. Call 301-255-4250 or download the Maryland SPDAP Application (PDF). In addition to the Part D plan premium, deductible and co-payments, those with incomes above $85,000 (individuals) and $170,000 (joint) pay an income-related premium adjustment. ** The additional monthly Part D income-related adjustment amount is not collected by the Medicare Part D plans, but instead directly deducted from Social Security, Railroad Retirement Board or the Office of Personnel Management benefits. Below is a summary of resources linked from other sections of this page. We are providing them in one spot here so you can find them easily in the future. Information about Medicare Part D coverage (on Medicare.gov). Printable form (on this site). A guide to help you document your prescription drugs. Start with your Zip Code and let Medicare help you find a plan (on Medicare.gov). Go here to fill this application out online (on ssa.gov). Information about Maryland SPDAP (on marylandspdap.com). Downloadable application for Maryland SPDAP (on marylandspdap.com).